The book offers a step by step guide to structuring training plans for athletes and clients. The adequate performance level is determined through a simple testing protocol. A broad overview allows for a quick and straightforward goal oriented creation of individual training programs, with various levels of difficulty and specific goals. 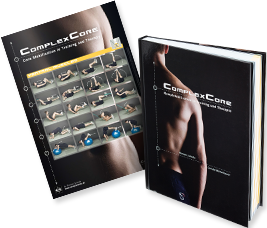 The book provides basic insight into functional anatomy of the core. The poster set shows exercises in different starting positions and offers an optional, valuable overview for your training. The poster set is sold out at the moment. The detailed explanation and the easy to understand navigation allows for a problem free implementation of the ComplexCore+ concept. Factors such as degree of difficulty, direction of movement, muscle groups and starting positions are clearly presented in an overview format. Information such as the motion sequence and muscle types is also presented. Four posters provide a quick and easy way for viewing and selecting exercises. The A2 sized poster contains 100 exercises for strengthening the ventral, dorsal, lateral and combined muscle groups.